PEANUT BUTTER COOKIE in HONOR NATIONAL PEANUT BUTTER COOKIE DAY | Cook, Party, Enjoy! 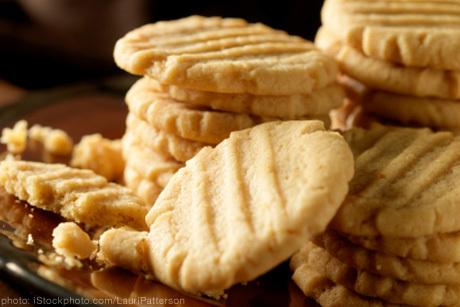 Here it is National Peanut Butter Cookie Day! June 12th lol and as promised I am posting this recipe. Perfect peanutty cookies, add a glass of milk and enjoy them. Using the Mixer, paddle and a large bowl beat the egg, butter and peanut butter until fluffy. Add sugars and beat until smooth. Add milk and vanilla. Mix in the dry ingredients; add peanut butter chips. Using the small scoop, scoop the dough and drop onto ungreased cookie sheet or stone. Space about 2 inches apart. Using the bottom of a glass flatten slightly and then using a fork, make a crisscross pattern. You do not want to flatten completely. Lightly sprinkle with sugar. Bake at 350º 10-12 minutes. They will be light brown, do not over bake. Cool 1 minute, then remove to wire rack to cool Makes 2-3 dozen. I hope you will give these a try. I make them often and they are gone before they even cool. ← GERMAN CHOCOLATE BROWNIES FOR GERMAN CHOCOLATE CAKE DAY JUNE 11!